From childhood, I had always wanted to serve the world around me as an activist. My Dad loved listening to BBC world news. I learned better English from the radio, but most of the news was bad, especially about wars. I felt I should do something to create good news when I grow up. In school, I was studying to become a lawyer or journalist. I had learned that those two professions were responsible for making the world a better place by exposing enemies of the world to judgment and punishment, but God called on me to be a teacher, because He knew it is a superior profession. Now, as the founder of Fastborns International Foundation, I focus on teaching peacemaking and building skills for youth. I had thought of using music as a channel for positive social messages. Music crosses all the boundaries of language, race, and religion, but it became so expensive for me to join the competitive music industry. I thought of all possible means and found out that writing was the easiest strategy to achieve my ambition. It was a matter of having pen and paper and it became so easy to access them, sometimes for free! I began writing a novel which I expect to publish by the end of 2012. Alongside the novel, I freelance for the local newspapers. 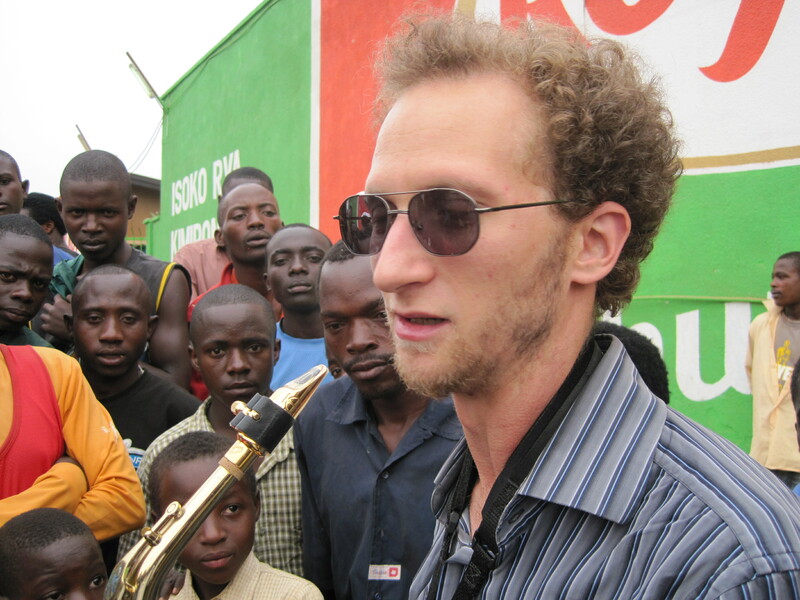 In 2010, Jeremy Danneman, an American saxophonist, emailed me, saying he was fond of my articles, especially one about the unpopularity of recreational reading in Rwanda. He told me about his street performance project, and suggested we might work together. His email excited me. I had never really known any Americans or Westerners very closely. The fact that he was a musician from New York, raised my expectations from him into a higher horizon. I thought he was a very rich celebrity in the USA. He became a symbol of a music career I thought was\is inside me. I expected a lot of fun, fortune and public approval from working with a New York musician in Rwanda. “You are going to be rich. You are now rich,” my co-worker shouted at me when I proudly showed him Jeremy’s email. After two weeks, Jeremy came to Rwanda. Soon after his arrival, I met Jeremy at Bourbon Coffee. I admit that it was my first time there. My expectation evaporated as soon as my eyes fell on him. He looked a simple man different from a music star from New York, the most famous city on this planet earth. He was dressed in untidy long sleeved dark shirt, an old pair of jeans , old sneakers and a saxophone in its sheath. He did not look like an American super star I was expecting. The next day I accompanied Jeremy, as a photographer and interpreter, for a performance at Kimironko Market, where an audience spontaneously formed and many people remembered him from when he’d been in Rwanda a year earlier. I got surprised by the type of music Jeremy played. He played different tunes to a meditative audience, and it was followed by a general discussion with audience members. I was with Jeremy for several street performances in Kigali. Some people thought he was abnormal, because they expected him to charge a fee for his performances. “This is a mad white man” one pedestrian commented as he performed along the street in Nyamirambo, the busiest suburb in the capital Kigali. “How will he get air ticket to take him back to America?”. Others would ask him the reason behind his performance, and he would get a chance to explain his cause that would lead to a discussion between him and his street audience. My experience with Jeremy Danneman’s performances along Kigali Streets showed me how music in public spaces can create peace, unity and reconciliation in any area of conflict. You see,here is the guy who just blows air into his saxophone while clicking its buttons stylistically to create a certain tune. Without a wordy verse or chorus but still people would stand by and listen. Music without words inspires meditation which is food for the soul. It is like listening to God. We understand that God speaks through sounds like thunder or wind. That is why most people love melodies and rhythms, often even more than the words used in a song. The most notable event was our visit to the Mutobo Rehabilitation Center. After consulting the National Demobilization Office, we made the 3 hour trip from Kigali. The residents of Mutobo had been soldiers in the forests of Democratic Republic of Congo for twelve to sixteen years, and were considered enemies of Rwanda, many of whom had ties to the militias that carried out the 1994 genocide. Now, they had surrendered and were adjusting to ordinary civilian life. 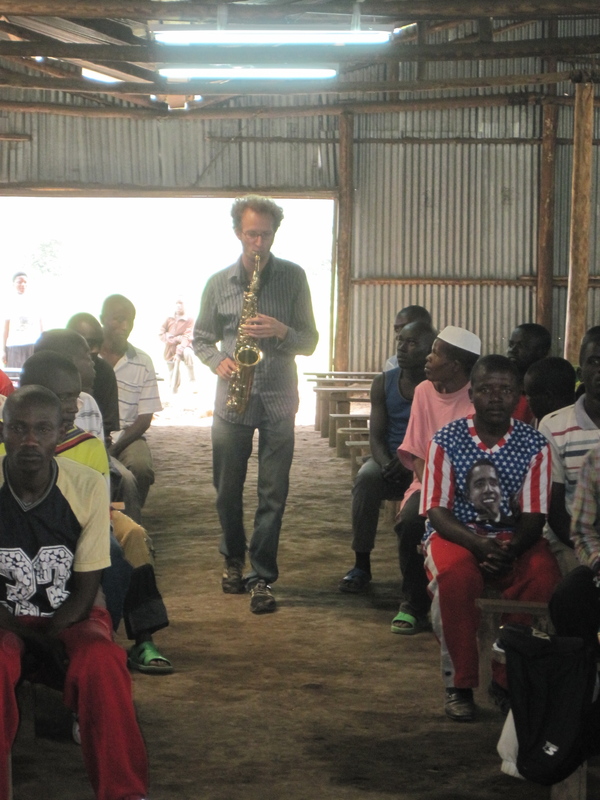 First, they sang in Kinyarwanda and danced for us, then Jeremy performed some jazz and klezmer music for them, and told them stories of how he happened to come to Rwanda and the experiences that led him there. They told him their favorite song was Bob Marley’s One Love. When Jeremy performed it for them, I saw the smiles on their faces and put down the camera and started dancing Reggae, as they clapped hands and applauded with joy and happiness, as if they were not living in a camp. They asked him many questions about the saxophone, his life, and even about Barack Obama. The trip to Mutobo was good, enjoyable, and fruitful. I could see it in Jeremy’s face. “Man, today was wow!” he said. 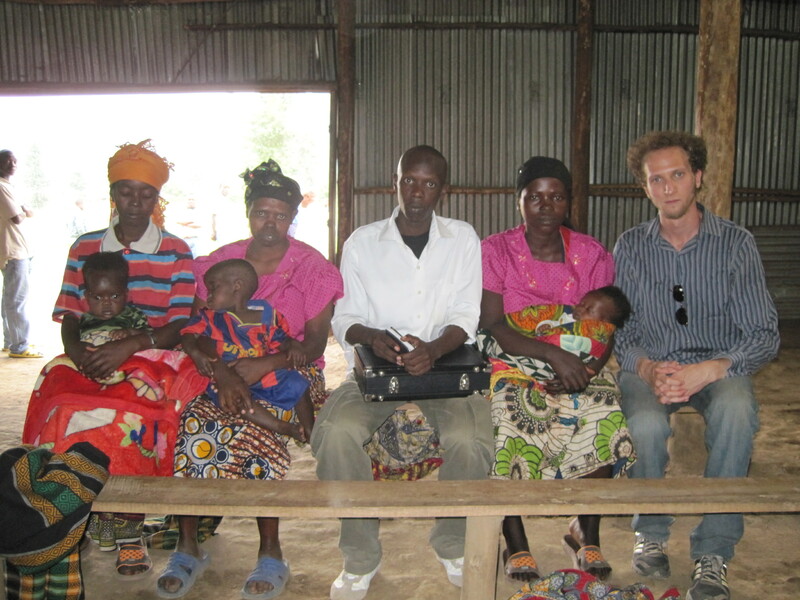 The author and Danneman pose with the female residents at Mutobo. I learned from Jeremy that artists especially musicians can play a big part in mending peoples broken hearts by creating dialogue space for the people to discuss their grievances and find remedies for them. Just like the press does though sometimes it may mislead the masses. For example the 1994 Rwandan Genocide is attributed to the press. Most people love music, and this is a big advantage for music artists to participate in creating peace,unity and reconciliation in communities which have experienced various types of conflicts because they command attention and respect from the society. They can do this on a non-profit basis since the majority cannot afford to attend their live concerts and have an interaction with them. It is from Jeremy’s humble project that I have learned that, if every artist sacrificed some of his or her time into the community, there would be a positive change in growth and development. Musicians can pay a big role in changing people’s mind sets. As most governments are embracing science and technology,they should understand that the arts specifically music remain a fundamental domain for making our world a better place for all of us, but that is a whole different article to write! This is the first of what we hope to be many guest essays published in the Parade of One blog. The views and opinions in this article may not reflect those of Jeremy Danneman or the Parade of One organization. To contact the author, please email Apollo Ndungutse – ndungutse.apollo@yahoo.com. To donate to Parade of One, or simply to learn more, please visit www.paradeofone.org.